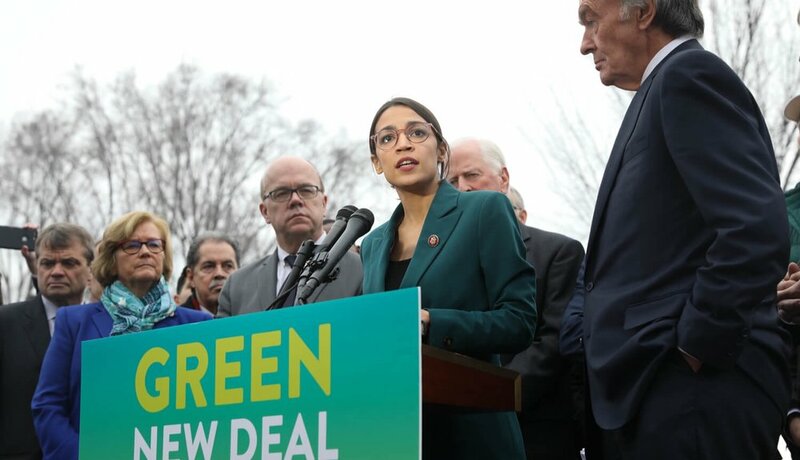 Representative Ocasio-Cortez (D-NY 14) and Senator Markey (D-MA) introduced the Green New Deal resolution to Congress on February 7, 2019—the climax to more than a decade of advocacy from writers, activists, former presidential hopefuls and environmental groups—with the hope of pushing the country to respond directly to the IPCC’s report that we have 12 years to limit the damage of climate change before risks of flooding, droughts and extreme heat increase exponentially. The report, unfortunately, failed to hold much weight to all 53 Senate Republicans, alongside four Senate Democrats—Doug Jones (Ala.), Joe Manchin III (W.Va.) and Kyrsten Sinema (Ariz.) and Sen. Angus King (Maine). But the damage being wrought by climate change is already being felt, most recently through historic flooding in the Midwest. And man-made environmental disasters are just as common and equally deadly. The recent chemical fire in Deer Park, around 20 minutes outside my home town of Houston, fringes primarily low-income Latinx communities in Channelview and Galena Park. And according to the Guardian, indigenous people and communities of color are historically the most affected by environmental degradation and face the biggest health risks from pollution. Still, centrist Democrats and Republicans have gone on record saying the proposal is too radical to be taken seriously. The bill has 84 co-sponsors in the House of Representatives, 11 co-sponsors in the Senate, and more than a fair share of critics. Sen. McConnell—whose choice to rush the Green New Deal to a vote in the Senate plainly expresses his distaste for it—is easy to identify as a critic. Trump, too, is clearly a critic. At the rally in El Paso, he claimed that under the Green New Deal, “You’re not allowed to own cows anymore,” and that the “radical Democrats” would “shut down” American air travel. Given that the majority of donations from oil and gas interests line the pockets of Republicans in Congress, few, if any, expected bipartisan support for the proposal, despite the fact that 81 percent of registered voters support the goals of the proposal to some degree. Still, not every Democrat has signed onto the Green New Deal either. The video of Diane Feinstein lecturing children on the impossibility of the bill went viral last month, highlighting, for some, the divide between old and young people and how it correlates with their stance on the bill. But what are you supposed to make of others like Nancy Pelosi? It’s more difficult to tell whether or not she can be called a critic. This is partly due to her continued tendency to say one thing and do the opposite. One might recall recently at the State of the Union when Pelosi clapped for Trump with an expression on her face some believed to be sarcastic. A meme within the hour, the moment was canonized on Twitter and news outlets alike as a brazen act of resistance. Later the next week, however, Pelosi clarified that she wasn’t being sarcastic: "Look at what I was applauding," Pelosi added. "I wanted him to know that was a very welcome message," referring to Trump’s call for unity and compromise. Her problem wasn’t with the wall itself, but rather with the amount of money they’d have to spend on it. She more than implied that she would have been fine with a cheaper alternative. With Trump announcing a national emergency to deal with the border wall, it will be interesting to see what, if anything, Pelosi might personally do to stop it. Here, she’s neither committing nor shrugging away from the prospect of support, which can’t be called support in and of itself but rather an openness to the concept. She welcomes the “enthusiasm,” whatever that means, but who’s to say whether or not she welcomes the bill? She’s standing oblique to the process, watching but not participating, commenting but not exactly saying much. It should be noted that Pelosi has seen the Green New Deal before, or at least an iteration of it. Prior to re-assuming her position as Speaker of the House, close to 200 activists from Sunrise Movement occupied her office demanding that she create a select committee for the purpose of shaping the Green New Deal. The committee would “have the authority to develop a detailed national, industrial, economic mobilization plan” for legislation—a “Plan for a Green New Deal.” The language should be familiar to her if nothing else. The committee is strikingly similar to one she outlined in 2007, but this time with major handicaps. Not only is it prohibited from “legislative jurisdiction”—a rule taken almost word-for-word from the handbook of the 2007 “Select Committee on Energy Independence and Global Warming”—but members are allowed to take fossil fuel money, a direct conflict of interest. Currently, Democrats have taken a little less than 62 million in fossil fuel money, which is why they are “ostensibly the anti-climate denial party” to some, rather than the party committed to outright fighting climate change. The committee was also stripped of the power to subpoena, which might have assisted in crafting legislation with the help of researchers, scientists and the heads of government agencies. Indeed, the main change is Pelosi’s rhetorical shift from “global warming” to “climate crisis.” Pelosi may want to call climate change a crisis, but it doesn’t seem like she actually wants to do anything about it. It seems she’s happy to be labeled as radical and more than comfortable to sit in the public eye for what she says. But that radicality is false, played up for the journalists in the room; her legislative actions never seem to follow through. In another article that I wrote for Latinx Spaces, I explained the problem with Beto O’Rourke’s willingness to compromise and his false commitment to legislation like Medicare for All. It is important to note that he is not the only politician to do so, and many presidential hopefuls have done the same—both with Medicare for All and the Green New Deal. While each of the sitting senators listed above co-sponsor the bill, it is yet to be seen how strongly they will work to bring it to fruition—and under what circumstances. Others have already noted that support for Medicare for All and the Green New Deal have acted as a sort of litmus test for Democratic candidates thus far. Are these candidates greenwashing their campaigns—simply promising to bring about a national shift toward sustainable production, without intending to make those promises a reality—or do they really plan on enacting radical green policies if and when they find themselves in the oval office? Despite the rhetoric of impending climate catastrophe throughout the Obama administration, international summits meant to address the issue head-on only ever brought back conservative targets to slightly reduce emissions. During the 2009 Copenhagen climate conference, “The U.S. insisted on a target that would allow temperatures to rise by 2 degrees Celsius despite passionate objections from many African and Pacific Islander delegates who said the goal amounted to a ‘genocide,’” the Intercept reported. It was Obama’s Special Envoy for Climate Change, Todd Stern, who at the same time maintained the need to act as superheroes, to find “that old comic-book sensibility of uniting in the face of a common danger threatening the Earth.” This is an example of campaign greenwashing: hiding behind environmentally conscious speeches while at the same time handicapping the fight for climate justice. Today’s presidential candidates—and, for that matter, the Speaker of the House—are two sides to the same coin. That is, they’re comfortable with branding themselves as environmentally conscious or having others call them radical. Some go as far as to say they agree with the Green New Deal; others cite that they “welcome the enthusiasm.” But, given their track records, how are we to know they’re willing to make the radical changes they say they will? As of now, the Green New Deal is more wishlist than definitive policy. It’s a good wishlist to be sure—covering everything from securing clean air and water for everyone to guaranteeing workers high-wage jobs—but because the bill doesn’t act as policy in itself, it’s impossible to say how much will remain after rolling through Congress. The bill essentially acts as a list of parameters under which the Green New Deal can be written. The question of how the Green New Deal is going to work has yet to be answered, rendering it a ripe political promise but perhaps not the best in terms of policy. It would be different if the Green New Deal proposal itself explained the steps we must take to transition to 100 percent “clean, zero-emission, renewable energy sources,” or “building a more sustainable food system that ensures universal access to healthy food.” That way, if a congressperson sponsors or agrees with the bill, one might be able to say more definitively that they’re willing to side themselves with the method in which we want to achieve our goals. But as of now, these are only proposals. How to best go about accomplishing these goals is going to be a long, contentious issue both inside and out of the Democratic party. Any member of Congress can sponsor or agree with the Green New Deal. What that means depends on who you ask. Recent studies back up the Green New Deal’s assertion that “systemic racial, regional, social, environmental and economic injustices” disproportionately affect “indigenous peoples, communities of color” and migrants. Largely due to segregation, people of color (68 percent of African Americans, 40 percent of Latinx people) are more likely to live near polluters and breathe polluted air, resulting in higher rates of asthma. And under the Trump administration, Obama-era environmental regulations like the Clean Power Plan have been pushed back, only worsening the divide between standards of living in the U.S.
As such, the Green New Deal is necessary most of all for the vulnerable communities it stands to help if implemented correctly. And the only way to ensure this is through direct action. The ten-year fight that it took to stretch the public consciousness toward acknowledging the Green New Deal isn’t over now, and it won’t be over if and when the bill is ever passed. At this point in time, voters can’t trust Kamala Harris or Kirstin Gillibrand, Elizabeth Warren, Bernie, Beto, or anyone who voted “present” this time around. It’s too easy for the Green New Deal to remain a political promise never to be revisited. Cover Image courtesy of Senate Democrats Green New Deal Presser and is licensed under CC by 2.0.